Please look below for more information on the two packages. We are also running a special offer! Remember, each of these packages comes with full resale rights. 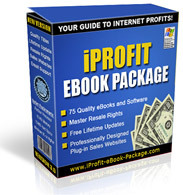 Join the 1000s of others who are making money selling E-Books & software, particularly on eBay. Your package will be available for download as soon as you make payment. This package contains 75 different pieces of amazing software. Each comes with individual resell rights and a professional sales page for you to use when reselling the item. Thats a saving of £4.99 if you were buying these items Separately. How you sell the items is upto you. You could sell them individually or sell the entire package. Just think, you are buying a total of 125 items for only £27.99. That works out at 4p per item! Remember this item is for a limited time only so take advantage of it today! Click below to purchase.